First hollow stem is the optimal time to remove cattle from wheat pasture (full explanation). We measure first hollow in our September-sown wheat forage plots at Stillwater each year, and normally have approximately 50% of varieties at or past first hollow stem by March 1st. I have posted first hollow stem measurements from these plots in a table at the end of this blog. No varieties are currently at first hollow stem at Stillwater, but I anticipate the small amount of moisture gained from recent snow and warming temperatures will spur onset of first hollow stem over the next week or so. We will take another set of measurements on March 10 and report the results on this blog. Keep in mind that the numbers reported from Stillwater are likely behind those being observed in southern Oklahoma and ahead of those observed in northern Oklahoma. Dillon Butchee in the Altus area reported finding first hollow stem in Jagger last week. 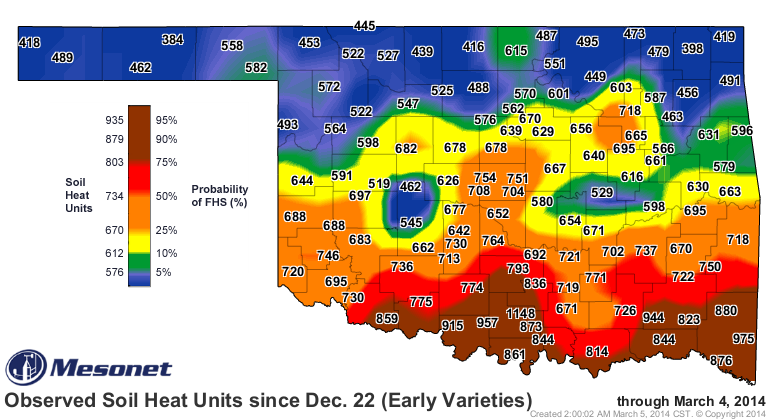 The First Hollow Stem Advisor on the Oklahoma Mesonet indicates that early varieties in southern Oklahoma are likely past first hollow stem and that early varieties in central Oklahoma will reach this point within a week. Keep in mind the one week projection uses historical weather conditions which exceed our current forecast. 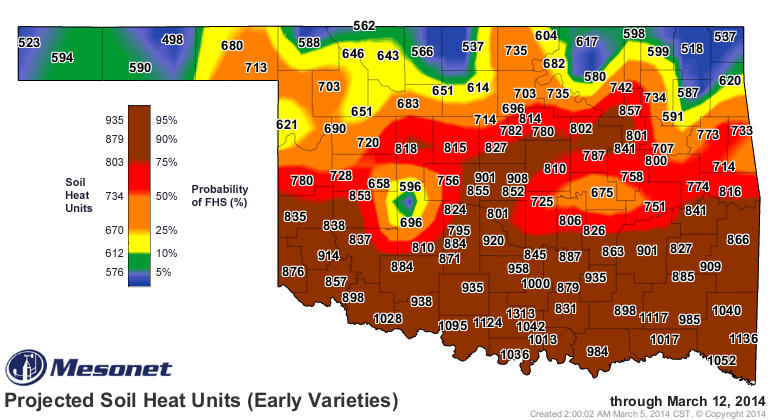 Cooler than normal conditions will not last forever, though, and my advice is to move cattle off of wheat pasture in southern Oklahoma yesterday, start moving them off of wheat pasture in central Oklahoma today, and move cattle off wheat pasture in northern Oklahoma next week. By osuwheat in first hollow stem on March 5, 2014 .